The Singing Pianos are back at Cécile & Ramone on April 25th. Book your tickets fast ! KARMA KAMELEONS will be at Délice Nightclub on April 18th. Come and see us to start the long Easter weekend! On March 13, do not miss Just Do Hits at the Casino de Charlevoix. To have fun and dance to the best song from the 90s to today, it's the casino that's happening! On Octobre 26, The Singing Pianos will be at the Cosmos Cafe Levis in order to spend the best evening with you! We promise you laughter and lots of fun! The Singing Pianos at the Roquemont! The Singing Pianos will come to perfom at the Hotel Roquemont on September 6 2018! Do not miss the chance to attend an original show and colored with humor! We wait for you there ! Gill Poitras will be at Les Frères Tocs every Wednesday until April 3, 2019. See you there! High 5 Coverband composed of the singer Liana Bureau will be at the Casino de Charlevoix on Saturday, March 2nd! The Spring Break with Karma Kameleons !!! March 2nd is the time to let go to celebrate with KARMA KAMELEONS! From 22h at Cécile and Ramone's! On Novembre 16, The Singing Pianos will be at the Cosmos Cafe Levis in order to spend the best evening with you! We promise you laughter and lots of fun! Gill&Gang Goes Contry will be at Stoneham ski resort on February 17th ! On February 15th the Casino de Charlevoix is welcoming The Singing Pianos to celebrate Valentine's Day ! Gill&Gang will also meet you the next day, February 16th ! KARMA KAMLEONS will be performing on Good Friday, April 19, in Rivière-du-Loup. Get together at the P'tite Grenouille and come party with us! Tone Call at the Casino of Charlevoix ! On December 22, it's at the Casino de Charlevoix that it happens! The group Tone Call will be on hand to animate the evening, good time and good music assured! Tone Call Band at the Casino of Charlevoix ! On Novembre Third, it's at the Casino de Charlevoix that it happens! The group Tone Call will be on hand to animate the evening, good time and good music assured! 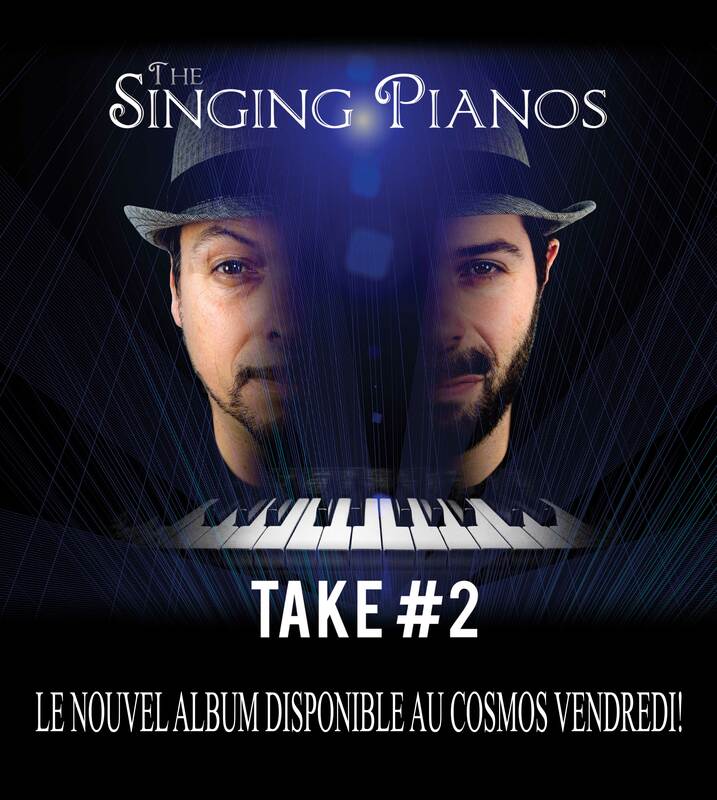 On Novembre Second The Singing Pianos will be at the Cosmos Cafe Levis in order to spend the best evening with you! We promise you laughter and lots of fun! On October 20, the restaurant Le Normandie is welcoming The Singing Pianos. Musical performance and assured laughter! Hope to see you there! GGGC au Casino de Montréal! 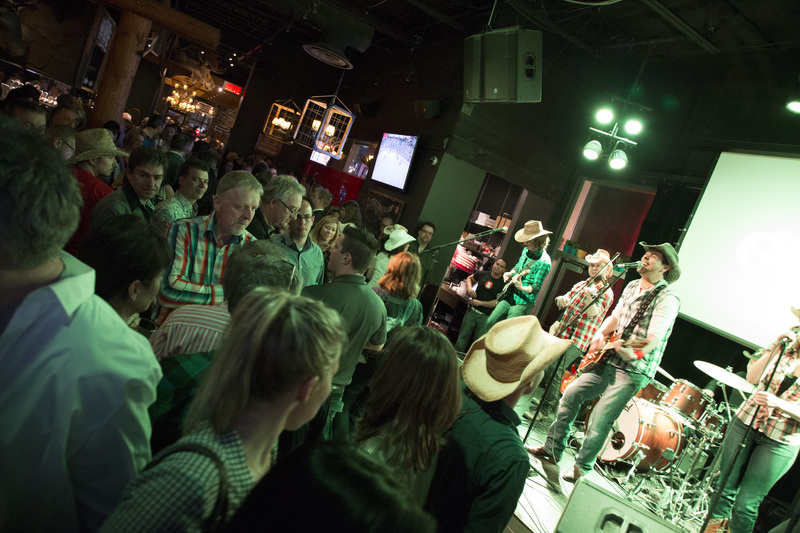 C'est avec beaucoup d'enthousiasme que la formation GGGC revient au Casino de Montréal dans le cadre du mois dédié à la musique Country! le 12et 13 octobre 2018, des 20h! C'est très bientôt! The singing Pianos récidive à la Place des Arts! Oui, Mesdames et messieurs, notre formidable duo ( voire trio cette fois!) retourne à la Place des Arts de Montréal afin d'y redonner une prestation du spectacle 'Les Mains Baladeuses", spectacle conçu pour les salles de +/- 300 pers. c'est du solide! Soyez -y le 3 octobre 2018,, salle Claude Léveillée, 20h. The come back of The Singing Pianos at the Levis Cosmos! On September 21 The Singing Pianos will be at the Cosmos Cafe Levis in order to spend the best evening with you! We promise you laughter and lots of fun! 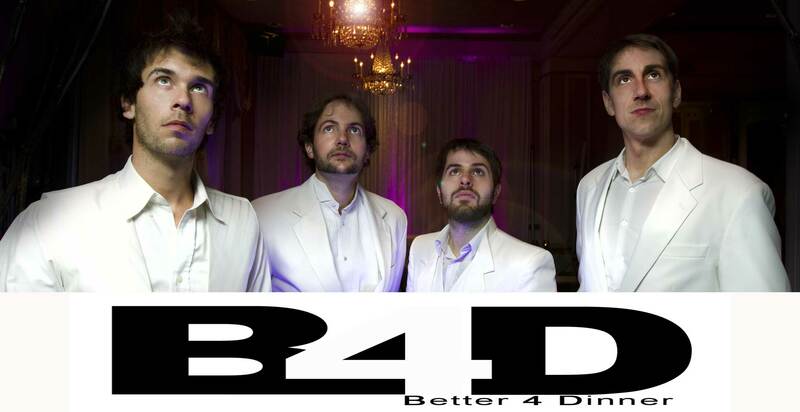 Better 4 Dinner will be at the Baie de Beauport on September 14 in a jazzy-electro atmosphere like you've never seen before! The Singing Pianos will be at the restaurant Houblon et Papilles on September 8th. Good food and entertainment guaranteed! It is on September 2nd that St-Croix will be entitled to a return to the time in the 80s! Do not miss this chance! Liana Bureau and her musicians will be at the Casino Bar Charlevoix on September 1st! Come and have yourself take a look! It is not to miss on August 21 at St-Henri, Mademoizelle Fizz will be at the Parc Berge Fleurie from 19h! 18 août 2018 - Venez Célébrez les 100 ans de CHARETTE avec les Singing Pianos! Charette — La Mauricie compte sur une nouvelle centenaire parmi ses municipalités. Charette soufflera sur 100 bougies cette année et de nombreuses activités viendront souligner l’événement. Le comité des fêtes du 100e de Charette est à pied d’œuvre depuis décembre. Les membres du comité ont tous la volonté de présenter des fêtes rassembleuses. «On veut faire des activités auxquelles tout le monde peut participer. Nos activités sont à prix abordables. L’objectif est d’avoir le plus de personnes», raconte la présidente du comité organisateur, Claudette Gélinas. Et les Singing Pianos feront partie de la fête! Do not miss the show of the Karma Kameleons on August 17 at Parc Saint-André. Guaranteed pleasure! August 14th Gill & Gang Goes Country will perform duet at St-Henri de Lévis at Parc Berge Fleurie! On August 4th, The Singing Pianos will be in Loretteville for an outdoor show open to all! Same formula, so much fun! On July 27, do not miss the karaoke party at the Casino! Fun, good music and host on the spot! We can not wait to hear from you! It's July 20th that The Singing Pianos will be at the Casino de Charlevoix! We are waiting for you in a piano-piano atmosphere, dancing and fun! Métabetchouan welcome the Karma Kameleons on July 7th! The 80s will take over the city and you do not want to miss it! It's July 6th that The Singing Pianos will be at the Casino de Charlevoix! We are waiting for you in a piano-piano atmosphere, dancing and fun! It's June 29th that The Singing Pianos will be at the Casino de Charlevoix! We are waiting for you in a piano-piano atmosphere, dancing and fun! On June 23, in celebration of National Day, Just Do Hits will be performing at the Charlevoix Casino! We are waiting for you in large numbers to celebrate St-Jean-Baptiste with you! Gill&Gang is landed at Percé! On June 23, in celebration of National Day, Gill & Gang will be performing in Percé! We are waiting for you in large numbers to celebrate the St-Jean -Baptiste with you! On June 21, it will be the show of Gill&Gang Goes Country at the Edwin-Bélanger booth! A show with country flavors that will surely give you the taste of dancing online! The Singing Pianos will be at Montreal Casino on June third! Do not miss your chance to assist to one of their performances! The Singing Pianos at the Montreal Casino! On June First The Singing Pianos will be at the Cosmos Cafe Levis in order to spend the best evening with you! We promise you laughter and lots of fun! A MAJOR EVENT for the MINOR LEAGUE! On April Fourth, the restaurant Le Normandie is welcoming The Singing Pianos. Musical performance and assured laughter! Hope to see you there! The Singing Pianos will come to perfom at the Hotel Roquemont on April Fifth 2018! Do not miss the chance to attend an original show and colored with humor! We wait for you there ! 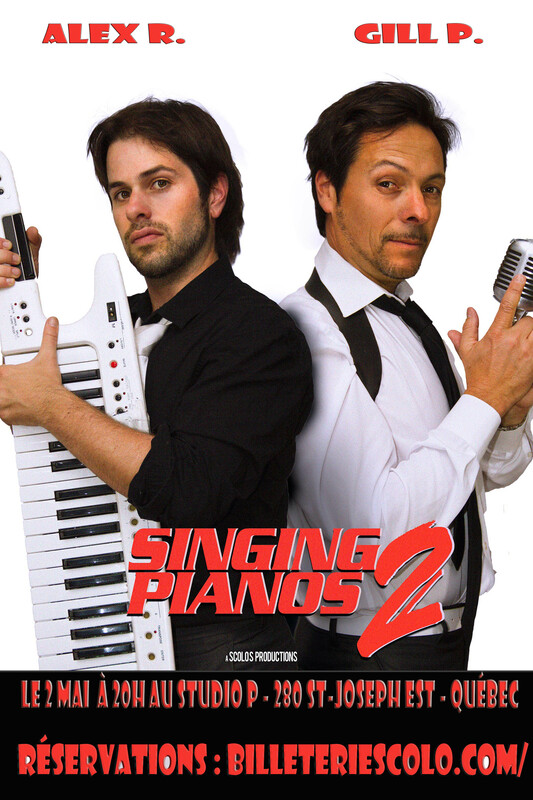 On March 23 The Singing Pianos will be at the Cosmos de Lévis in order to spend the best evening with you! We promise you laughter and lots of fun! On March 23 it is the first of Highway Stars at the Casino of Charlevoix! The succes of the 70's for sure be at the rendezvous! Hope to see you all there! On March 17 do not miss Just Do Hits to the Casino of Charlevoix. To have pleasure and dance on the best song of the 90s until today, it is to the casino that it takes place! On March Third, the restaurant Le Normandie is welcoming The Singing Pianos. Musical performance and assured laughter! Hope to see you there! 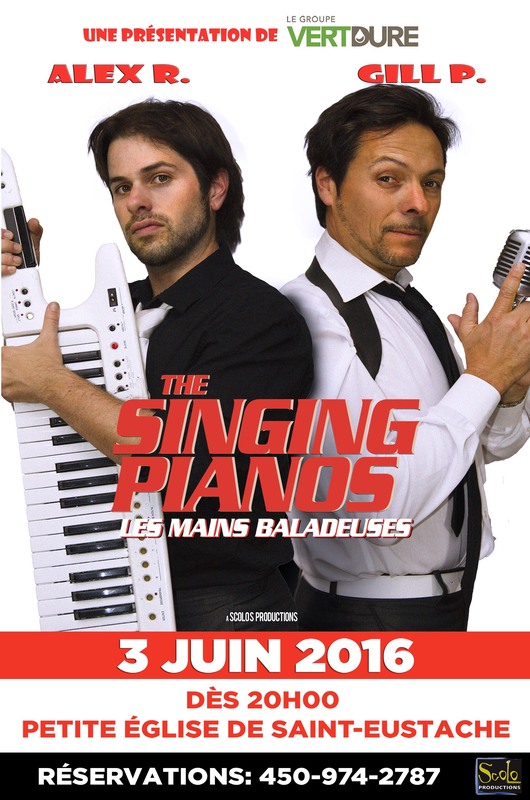 The Singing Pianos will be at the Cosmos de Lévis in order to spend the best evening with you on February 23! We promise you laughter and lots of fun! The Singing Pianos will come to perfom at the Hotel Roquemont on March First 2018! Do not miss the chance to attend an original show and colored with humor! We wait for you there! The Baril Grill St-Georges is welcoming The Singing Pianos February 24! Do not miss this opportunity to sing and dance all evening! The Moondance Orchestra will be present on February 16 and 17 at the Casino de Montréal, it's not to be missed !!! On February 10, it's at the Casino de Charlevoix that it happens! The group Tone Call will be on hand to animate the evening, good time and good music assured! On February 10, the restaurant Le Normandie is welcoming The Singing Pianos. Musical performance and assured laughter! Hope to see you there! 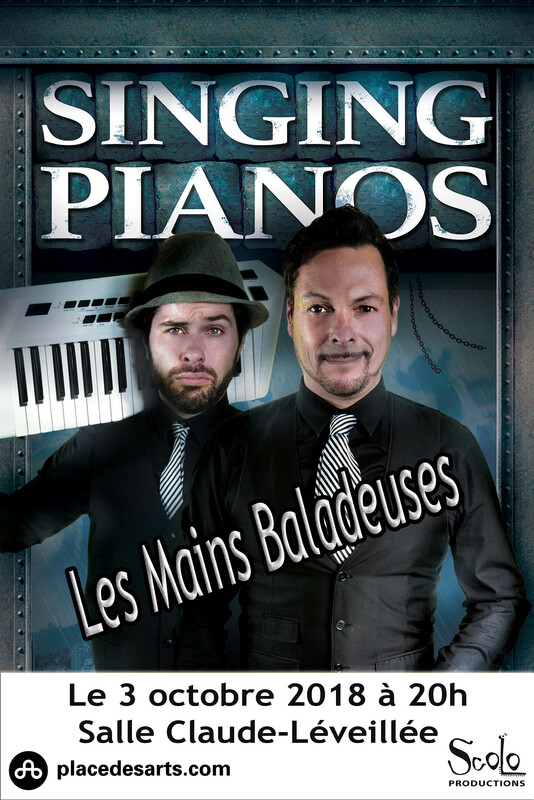 On February 9thThe Singing Pianos will be at the Cosmos de Lévis in order to spend the best evening with you! We promise you laughter and lots of fun! The Singing Pianos will come to perfom at the Hotel Roquemont on February 8th 2018! Do not miss the chance to attend an original show and colored with humor! We wait for you there ! The Singing Pianos at the Casino de Charlevoix! On December 8th, come and celebrate with us! Our trio will entertain you all the evening with the best songs of this year as well as the 80s and 90s! A beautiful evening guaranteed! See you there! On November 17th, The Singing Pianos will be at the Cosmos de Lévis in order to spend the best evening with you! We promise you laughter and lots of fun! On November 9th it is the country night at Délice Nightclub! A 100% country atmosphere awaits you so put on your best clothes and join us! The Cosmos is welcoming again The Singing Pianos! November 3, it is at the Cosmos de Lévis that it happens! A fun and entertaining atmosphere await you! Hope to see you there! On October 27th The Singing Pianos will be at Comos de Lévis to make sure you have a great evening! Humor and good music are for sure going to be there! The Karma Kameleons at Thetford Mines for a good cause! On October 27th, we are very pleased to announce that the Karma Kameleons will perform at Mont Granit to raise money for children with learning disabilities. The ticket are $ 25 each, door prizes and a party with flavors of the 80s that you will not forget! Hope to see you there! 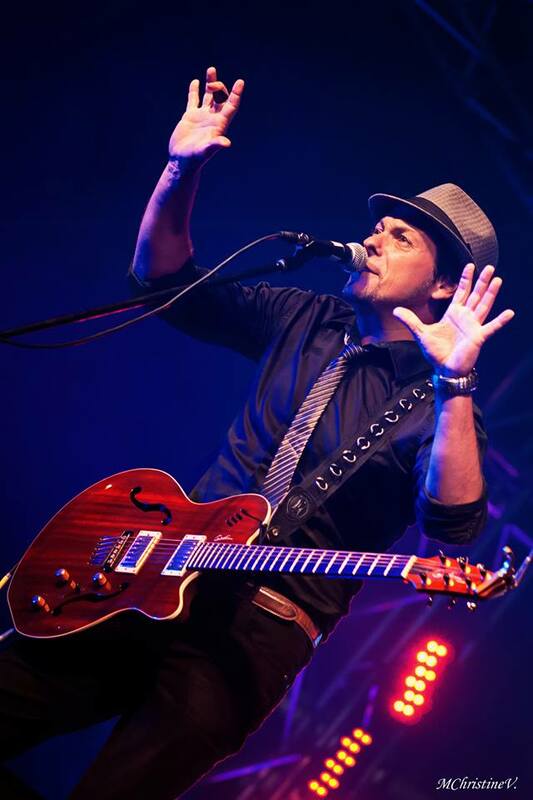 On October 13, Just Do Hits will be at the Casino de Charlevoix to entertain you until the middle of the night! Do not miss this chance to spend a fun evening with them! We are waiting for you! The Singing Pianos are back at the Cosmos of Lévis starting on October 6! Come and enjoy a lively evening! The Singing Pianos at the Roquemont ! It is on September 22n, 2017 that The Singing Pianos will come to perfom at the Hotel Roquemont! Do not miss the chance to attend an original show and colored with humor! We wait for you there ! High 5 Coverband will be present at the Casino of Charlevoix on September 15th and 16th 2017 under two different formula! On the 15 expect a trio formula which brings a more acoustic and intimate touch. On the other hand, On September 16 the full band is waiting for you and they will rock the room! It will be the time to come to dance so join them to have fun! It is on September 2nd that Gill&Gang will occur to the Casino of Charlevoix. As usual an energetic atmosphere will be felt in the room what will give you undoubtedly the taste to dance! See you all on September 2nd! Always funnily, simplicity and with rhythm, The Singing Pianos will be at the Casino of Charlevoix on September 1st to amuse you and give you to smile all evening long ! The Karma Kameleons will be present for the Festival of the Lake in party on August 12th at the Lake Mégantic! Come celebrate with them this beautiful festival to the sound of the 80s! Rock Pilots will come to liven up the evening with its directory of the 60s in today! Come to learn on the agriculture while discovering a dynamic group and a specialist in Rock. You are waited there! Tone Call in duet will be on show in the Parc Berge Fleurie for the Continuous-Flow concert on August 8th. Come to discover their universe of the 80's until today. Memories and pleasure guarantee ! On August 5th do not miss the return of Just Do Hits to the Casino of Charlevoix. To have pleasure and dance on the best song of the 90s until today, it is to the casino that it takes place! On August 3rd Le Délice at Lévis reserves you one evening Country music accompanied with the group Gill&Gang Goes Country. The best songs of the classic Country music up to New Country music of today are there. It is not to be miss ! The Singing Pianos at Donnacona ! On August 2nd, The Singing Pianos will visit the city of Donnacona for an outside show on the occasion of the Musical Evenings. Come to visit us in the Parc des Anglais people from 7:00 pm. We hope to see you there! The Festival of Fort Causap celebrates its 20 years and it is with the Karma Kameleons that it will take place on July 29th ! Do not miss this opportunity to relive the best moments of the 80s with a dynamic group and which will offer you quite a musical performance ! Come to sing and to dance on the hits from the 90s till today on July 28th at the Casino of Charlevoix. An evening filled with rhythm and with success guarantee! On July 22nd of this year will take place for a 31th edition the popular Party Hot dog of the optimistic Club of Notre-Dame-du-Lac! This year, they spoiled you, because the Karma Kameleons are the one who shall set fire to the beach! To celebrate this special opportunity with us, get yourselves your online tickets. We hope to see you over there! Come to celebrate with us on Friday, July 21st which will undoubtedly be very festive in the Park the flowers of the golf. Humor, music and pleasure will be there! The Karma Kamelons will be present on July 20th in Havre St-Pierre! Come to live beautiful moments in family accompanied by your favorite music. What is better to make know the music of your adolescence to your children. You are waited there in large numbers! On July 19th, The Singing Pianos will be present to amuse you below the big top in at the IGA of Boischatel. Come to laugh and to dance with both funny which shall offer you one of their own performance. Do not miss cetrte opportunity ! On July 16th the Karma Kameleons and The Singing Pianos will play at Lac Etchemin to celebrate the 150th anniversary of the city! Two big shows the same evening not to miss ! Arrive early to take advantage even more of the evening. In the pleasure to see you there ! The agricultural show of Portneuf reserves to you quite a show this year: the Karma Kameleons!!! The group will be present to offer you all your favourite successes of the 90s. Come take advantage of this day to learn more about agriculture and to relive your early years. See you there ! It is with beautiful Liana Bureau and her musicians that the campsite Under Wood welcome the group High 5 Coverband to amuse you all evening long. Gather family and friends for an entertaining and surprising evening! It is on July 5th that Gill&Gang Goes Country will offer you a show at the IGA of Boischatel. Come to discover a duet lively and energetic Country music who shall give you undoubtedly the taste to dance! On fourth of July the municipality of La Pocatière is welcoming Tone call for thier Tuesdays Show ! Come and benefit of the sun with them, because the show is outside. See you there ! The Singing Pianos at the Secret des Dieux ! The Singing Pianos will be back on July 1st at the Secret des Dieux. Pleasure, laughter and dance will certainly be there. Do not especially lacking this evening ! For the Anniversary of Canada, the Karma Kameleons will be in show at Thedford Mines on July 1st, 2017. We thus wait for you at the Municipal Stadiuml of Thedford Mines for an electrifying show ! Gill&Gang Goes Country at la Malbaie ! On June 30th the city of Malbaie receives Gill&Gang Goes Country in the car park of the library Laure Conan! Put on your boots as well as your cowboy's hats and join you to them for one dance which will be out of the ordinary. We hope to see you there in large numbers ! It is in a festive and colored atmosphere that the Ginger receives the Singing Pianos on June 22nd. The group will amuse you with their humor and their diversified playlist which will make you vibrate all evening long. Take advantage of this opportunity to join you to them! It is during this evening that you will undoubtedly live a throwback time in the 90s to 2000. For sure, the playlist will remind you of your high school and of your prom. Come and celebrate your second high school prom with them! It is provided of them hats and with their pianos that Singing Pianos will offer you a delirious entertainment and an excellent musical performance. Come and celebrate with them ! On June 2nd, your favorite group of the 80s is back for the Festival of Mounts Buckland to play you your favorite successes. Pleasure and memories are guarantees! It is the time of a weekend that the Singing Pianos will fire the boards of the Hotel Roquement. Do not miss this special opportunity to join you to them and to make a surprising discovery ! During all the weekend Tone call will be present at Pohénégamook at the Microbrasserie Le Secret des Dieux to make you dance all night long. It is during all the weekend that the group The Moondance Orchestra will be at the Casino de Montréal to make this night one of the most memorable ! It's on May 19 to May 21 that the High 5 Coverband is going to be present at the Casino de Charlevoix. Come and benefit of a night full of fun and of entertainment ! It's on May 13 that the Karma Kaméleons are coming to Cécile et Ramone to put some ambience in your evening. Come and join us ! Come and have fun with us on Friday May 6, we promess you a night that you won't forget ! What a nice evening at Le Capitole de Quebec for the 15th anniversary of KARMA KAMELEONS here's a preview and thanks to the fans! En janvier, c'est le bon moment de remettre à jour les présentations visuelles de nos produits :-) Voici GGGC 2017! Merci Bruno Chassé de Productions Idéo pour ces images magnifiques! 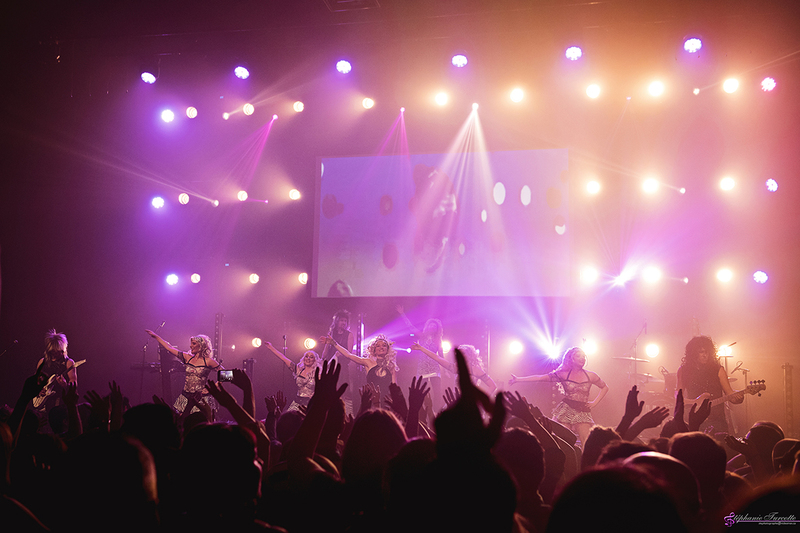 For more than 12 years, the phenomenon « KARMA KAMELEONS » made thousands of Québécois dance on the 80's musical hits. Their popularity now goes as far as Europe. In fact, they will be flying on monday to FINLAND, where they will give a concert for the JCI WOLD CONGRESS in Tampere. You also want to live the best moments of the 80's again? 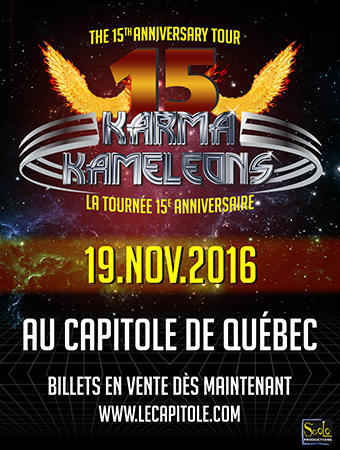 Come celebrate the 15th ANNIVERSARY of the Karma Kameleons by getting your tickets for their NEW SHOW AT THE CAPITOLE DE QUÉBEC. On saturday the 19th OF NOVEMBER, it's a new « medley », new HD images and an updated look that await you. You will have the chance to assist a THREE HOURS SHOW without intermission. What a perfect time to renew with the greatest songs that has marked the history of music!!! Ne manquez pas la prestation des Singing Pianos le 3 juin prochain! 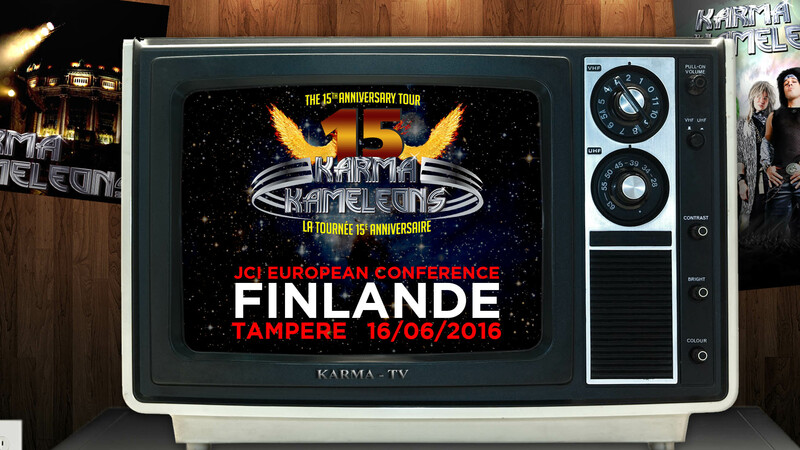 The KARMA KAMELEONS 15th anniversary Tour announced! C'est officiel! Les KARMA KAMELEONS célèbreront leur 15ième anniversaire avec quelques mille fans au Capitole de Québec! Serez-vous du nombre ? A new vids for The Singing Pianos! Le Château Frontenac a eu la gentillesse de nous prêter le Cellier - une salle magnifique - afin que les Singing Pianos puisse nous démontrer ce qu'ils arrivent a faire en utilisant certains gadgets! Impressionnant! à voir sur la page The Singing Pianos! 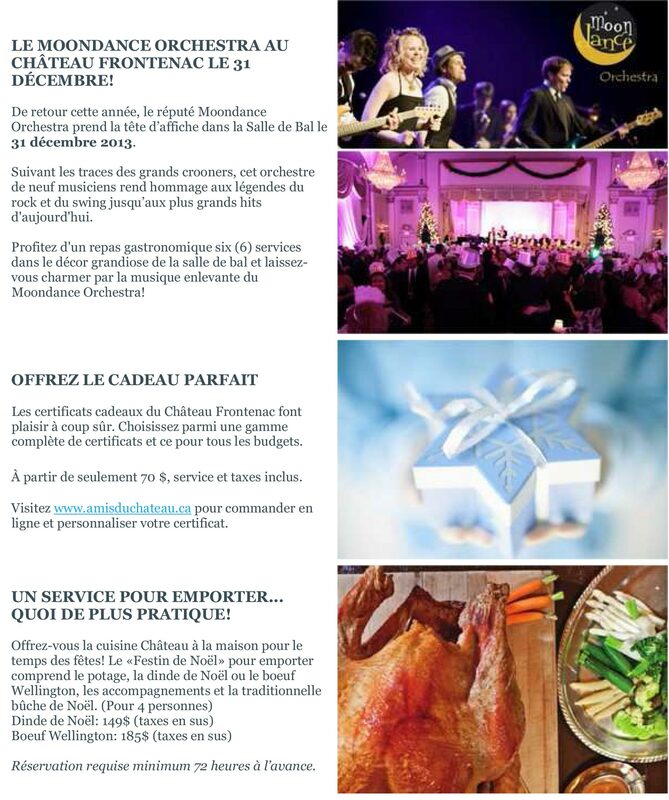 New year's eve with The Moondance Orchestra at le Chateau Frontenac! C'est toujours un plaisir de se retrouver dans le cadre enchanteur du Château Frontenac. C'est donc avec joie que pour une quatrième année consécutive, le Moondance Orchestra dirigera les festivités de la salle de bal du Château. Dès 20h. La nouvelle vidéo de présentation des KARMA KAMELEONS 2015! 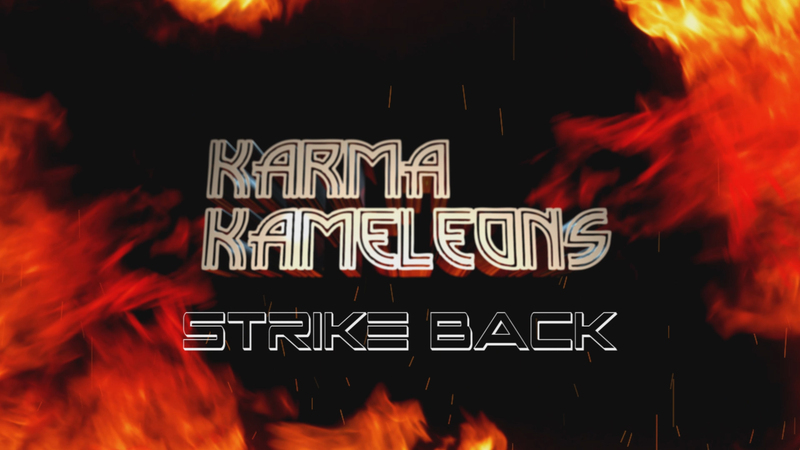 Vous n'avez pas vu la nouvelle vidéo The Karma Kameleons Strike Back 2015? 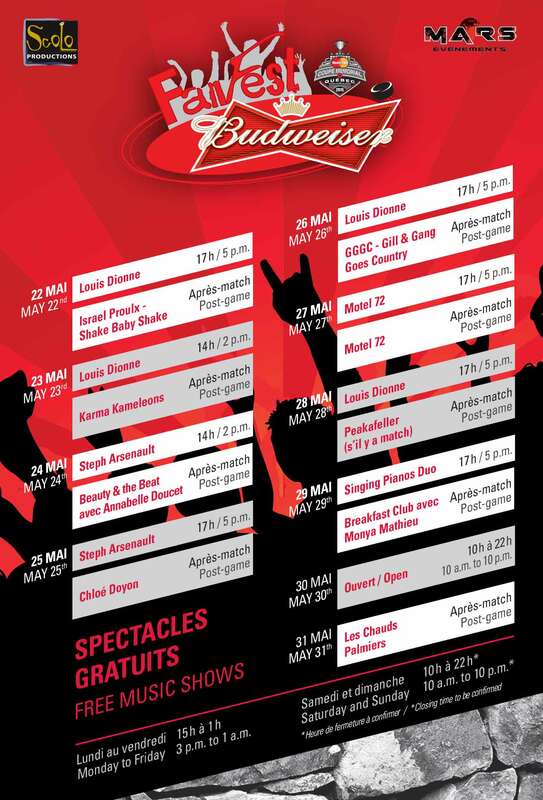 C'est un privilège et un plaisir pour l'équipe de Scolo Productions de participer à la programmation du FANFEST Budweiser de la coupe MEMORIAL qui se tiendra au Colisée Pepsi du 22 au 31 Mai 2015. Merci à MARS Événements, au Groupe Tanguay ainsi que Quebecor de faire confiance à nos nombreux artistes! 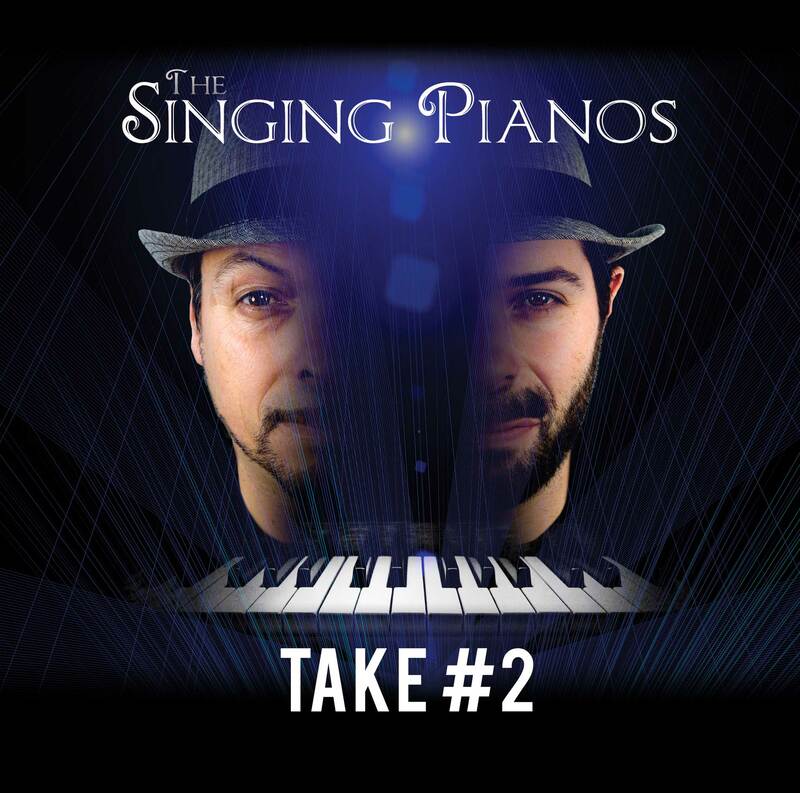 L'album Take#2 The Singing Pianos disponible dès vendredi prochain! On l'avait souhaité!, le nouvel Opus de nos fantaisistes préférés sera la vedette ce vendredi santi au Cosmos Café de Lévis où le groupe donnera un spectacle! A new Video for The Singing Pianos! New Video 2015 for Moondance Orchestra! Le voilà! il est tout nouveau, tout SHOW! Le Nouveau Clip Promo du Moondance Orchestra! The Singing Pîanos go WEST! It's now Official! 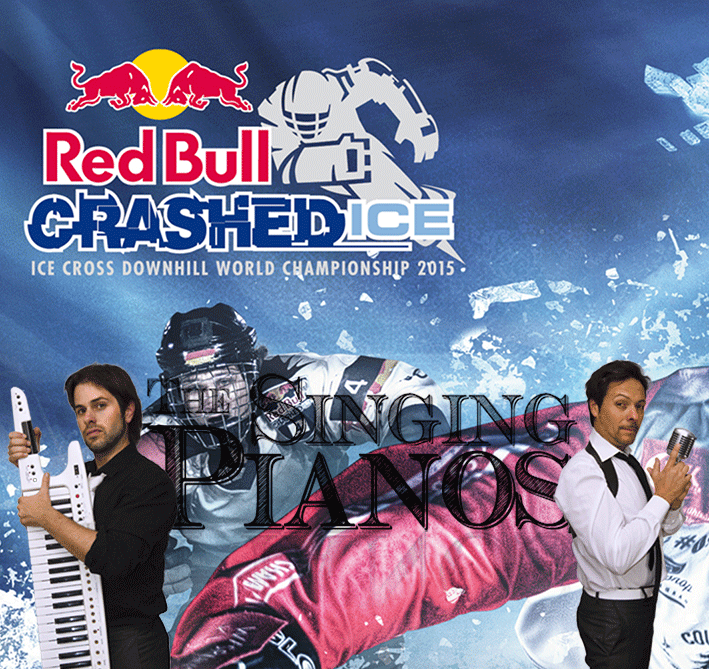 The Singing Pianos will be part of the Festivities in Edmonton for The RebBull Crashed Ice! Can't wait to be there! 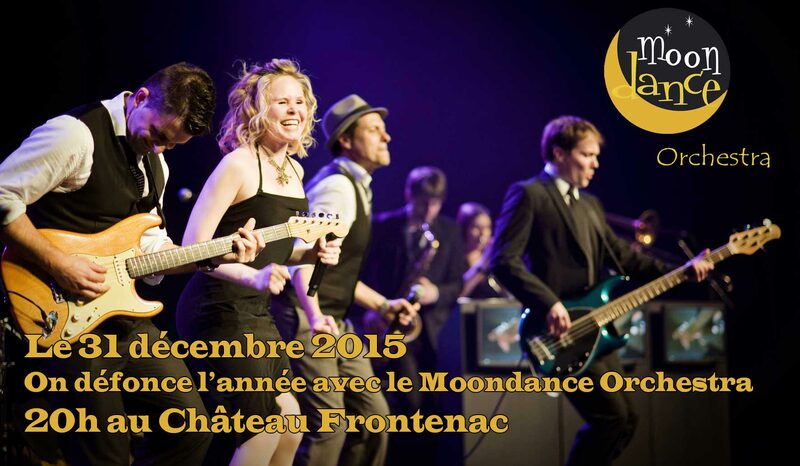 New year's eve at The Chateau Frontenac With Moondance! 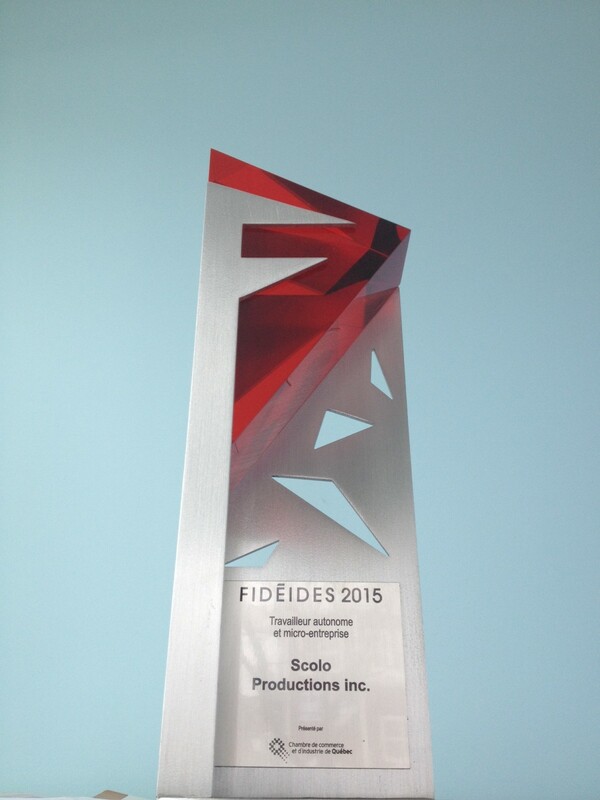 The band is proud to be part of the festivities at le Fairmont Chateau Frontenac for three years in a row! La chanson ''Le Ferry'' de GGGC tourne à la radio!! Nous en sommes très fiers!! L'album "On The Road" commence à faire des petits et une des chansons originales de l'album tourne depuis peu sur les ondes de différentes stations country au Québec mais aussi au Nouveau-Brunswick et même en Alberta! À ce rythme, GGGC sera sans doute de toutes les fêtes à l'été 2015! Souhaitons que ce soit dans un festival près de chez vous!! Le Moondance Orchestra - De nouveau au Bal du Maire de Québec! Nous sommes fiers de vous annoncer que Le Moondance Orchestra fera de nouveau partie de l'événement, "Le Bal du Maire" de Québec présenté au Fairmont-Château Frontenac le 5 décembre prochain. Nous en sommes à notre troisième présence à cet événement annuel qui n'a que 4 ans et qui vient en aide à la fondation Québec-Jeunes. Karma Kameleons à juste pour rire ! Dernièrement a eu lieu le festival Juste pour Rire et c'est avec un immense plaisir que les Karma Kameleons ont ouvert le festival avec l'humoriste de l'heure P-A Méthot à l'animation. Un spectacle grandiose qui a attiré plus de 50 000 spectateurs ! Une bonne foule s'est rassemblée à L'Archibald Duplessis le 24 avril dernier afin d'assister au lancement de l'album "On The Road". La formation a aussi donné toute une performance ! Enchainant les hits de l'album ainsi que quelques grands classiques de la musique Country-Rock du moment! C'est avec beaucoup de fierté que la formation Better For Dinner accueillera les cyclistes à leur arrivée après qu'ils aient parcouru les 135 km de la Boucle du Grand Défi Pierre Lavoie qui se tiendra les 14 juin 2014. Par la suite, le quatuor se déplacera à Montréal afin d'y accueillir les équipes de cyclistes plus affranchis qui auront accompagnées le grand Pierre Lavoie dans son parcours de 1000 km! C'est à l'Archibald Duplessis le 24 avril prochain à 20h qu'aura lieu le lancement officiel de l'album On The Road de la formation Country-Rock GGGC! Naturellement, le groupe donnera une prestation toute spéciale pour l'occasion ! At Montreal's Casino : The Singing Pianos! C'est une première pour la formation Singing Pianos. Dimanche le 6 avril à 13h, la formule trio entamera ses joyeux airs rassembleurs sur la scène du Casino de Montréal. C'est une première... Mais sans doute pas une dernière!! The Singing Pianos en salle!! À la demande générale, nos gentils jeunes gens remettent ça, persistent et signent une autre représentation de leur spectacle en salle intitulé "Les Mains Baladeuses". Cette fois, c'est au Studio P de Québec que ce spectacle à la fois musicale et humoristique sera présenté le 2 mai à 20h. Vous pouvez réserver vos places en ligne sur http://billeteriescolo.com au coût de 18$ taxes incluses. À la porte, les billets sont à 20$ et 15$ pour les étudiants. Faites vite car les place sont limitées! 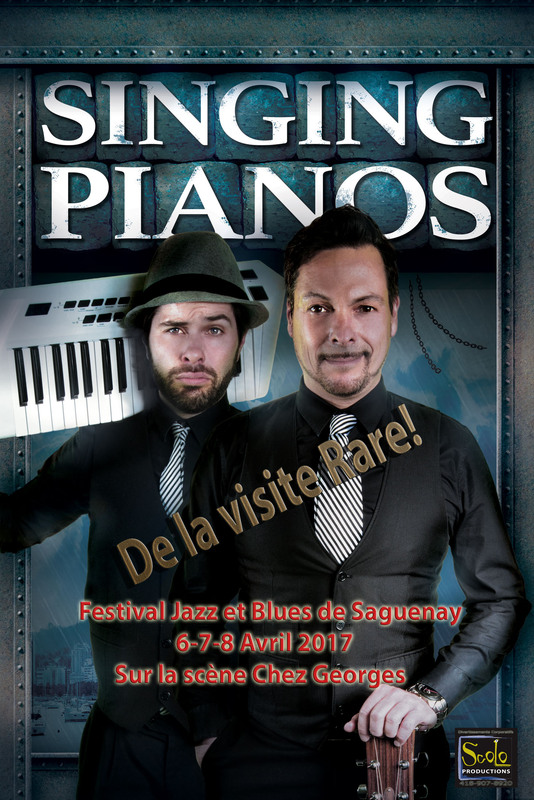 The Singing Pianos au festival JAZZ et BLUES de SAGUENAY en Avril 2014! Enfin! Un vidéoclip pour GGGC! Question de mettre un peu de soleil et de chaleur "texane" dans vos coeurs, voici enfin le premier vidéoclip de la formation GGGC qui lancera son album "On the road again" officiellement en mars prochain! Le premier d'un longue série!! Venez défoncer l'année avec vos idoles des Années 80! 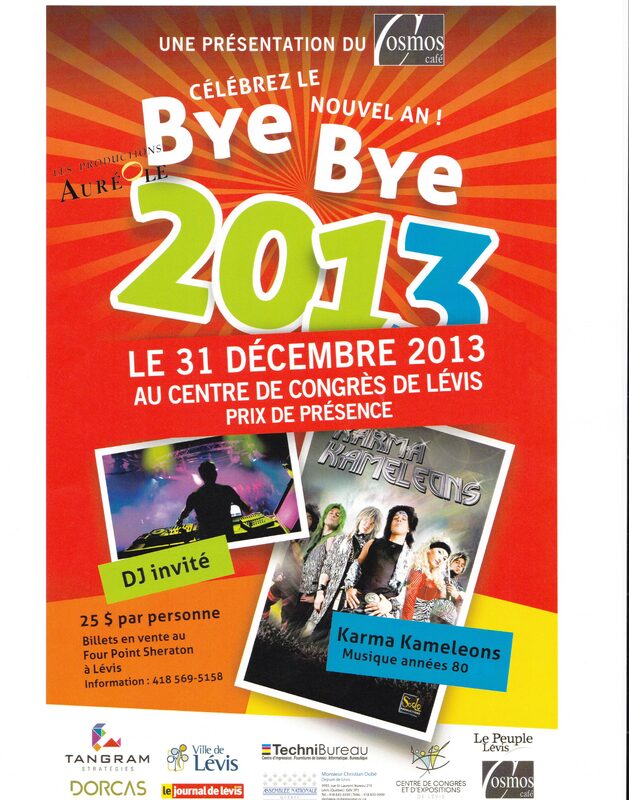 Les merveilleux KARMA KAMELEONS seront les vedettes du réveillon "Bye Bye 2013" au Centre des congrès de Lévis le 31 décembre 2013! Les portes ouvriront dès 20h pour les festivités avec un DJ invité et par la suite, les Stars du Rock prendront la scène d'assaut afin de vous accompagner dans les dernières heures de 2013 et, après quelques bisous de BONNE ANNÉE! Ils débuteront l'année 2014 avec vous pour être ensuite relayé par le DJ jusqu'à tard dans la nuit! Le Moondance Orchestra le 31 Décembre au Château Frontenac! 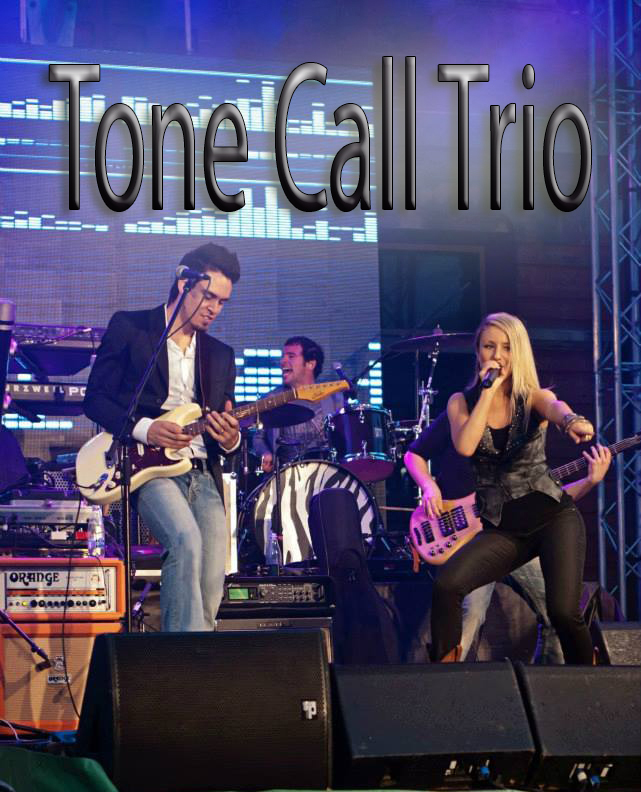 Tone Call Trio au Casino de Charlevoix! C'est une première! La dynamique formation sera au bar du Casino de Charlevoix les 20 et 21 décembre prochain dès 22h! Ne ratez pas cette chance! Les KARMA KAMELONS au premier « MOUSTACHEFEST » de Montréal! C'est avec beaucoup d'enthousiasme et de fierté que les KARMA KAMELEONS ont répondu positivement à l'appel deRadio NRJ - 94.3 Montréalet participeront au premier "MOUSTACHEFEST" auLA TULIPEde Montréal le 27 novembre prochain à 20h. Cet événement - des plus 80's - saura vous charmer et vous replonger dans cette époque magique où le poils régnait en maître sous le nez de ces messieurs! Gill&Gang au Casino de Charlevoix le 22 et 23 Novembre! Venez faire la fête dans un cadre fantastique avec G&G au bar du Casino de Charlevoix! Le répertoire du groupe reconnu pour être des plus versatile est de plus en plus actualisé! Ce week-end vous entendrez, entre autres : Wake me up! de Avici, Counting Stars de One Republic, Cruize de Florida Georgia Line et Treasure de Bruno Mars! Suivez les KARMA KAMELEONS au DAG les Jeudis ! 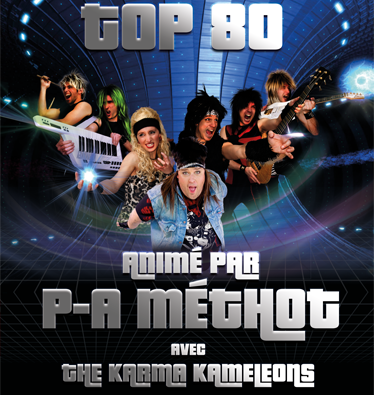 Les KARMA KAMELEONS sont revenus en force pour une série de 12 concerts au très célèbre Dagobert Night-Club! Venez faire la fête avec nous! Cette semaine, nos intrépides jeunes gens performeront sur les plaines d'Abraham derrière le Musée National des beaux-Arts pour la fondation du même nom dans le cadre des Grandes Soirées au Jardin . Mercredi, soirée corporative et Jeudi, soirée grand Public. Vous pouvez même pic-niquer sur place! Des commentaires élogieux et très encourageants pour les KARMA KAMELEONS! La dynamique formation Cabaret St-Tropez / Moondance était en spectacle au Manoir Richelieu le 27 avril dernier afin de divertir l'Association des Propriétaires de Machineries Lourdes du Québec (APMLQ). Tout le monde (incluant le band) s'est bien amusé lors de cette thématique de Joyeux Naufagrés ! Les hits de l'heure entre-coupés de la Compagnie Créole...Ça marche !! Costumes de Matelots et de Capitaine inclus! GGGC on the road again ! The Singing Pianos - Enfin en Salle! Les divertissants « Singing Pianos » seront en spectacle à la Scène Lebourgneuf (815, boul. Lebourgneuf bureau 200) le 17 MAI prochain à 20h. Un tout nouveau spectacle multimédia conçu pour vous faire rire et chanter! Ils seront aussi accompagnés de M-A Delarosbil, le dynamique percussionniste! Les billets ne sont que 22$ tx incl. Et la salle ne contient que 200 places. Alors faites vite ! The Moondance Orchestra at the Fideides! 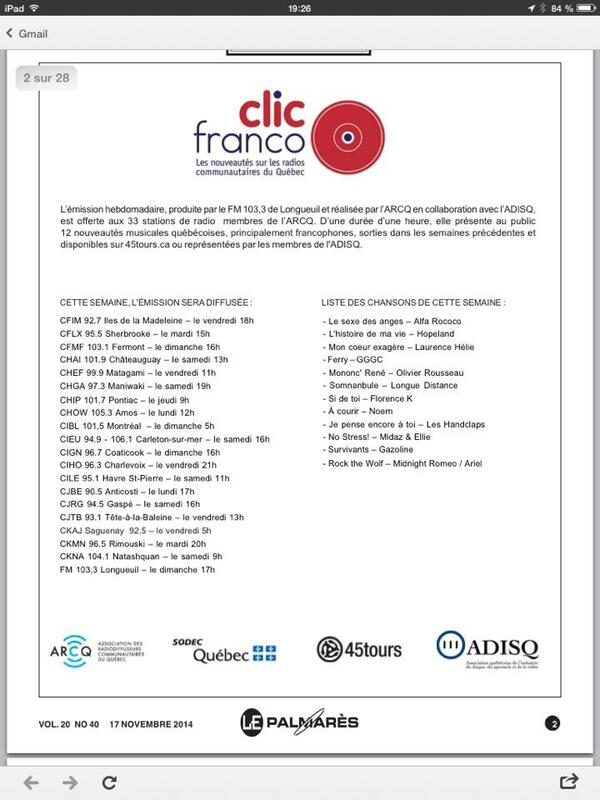 C'est avec beaucoup de plaisir et de fierté que le Moondance Orchestra a accepté l'invitation de la Chambre de Commerce de Québec afin d'aller "divertir" les quelques 1000 convives qui seront réunies au Centre des Congrès de Québec le 14 mars 2013. En plus d'un numéro spécial d'une durée de moins de 20 minutes, Les musiciens de la formation exécutera aussi les entrées et sorties musicales (Tags) des lauréats. Cette soirée sera animée par nul autre que Pierre Jobin, chef d'antenne à TVA-Québec. Bonne chance aux finalistes! Vous avez personne avec qui souligner la St-Valentin ce soir? Pas question de rester seul chez vous! KARMA KAMELEONS vous invite pour encore une fois TOUT UN PARTY au Dagobert. Qui sait, peut-être allez vous rencontrer une personne qui aime autant que vous les années 80. Les intérêts communs, c'est un bon départ non? Jeudi 14 février, la formation Gill&Gang Goes Country chevauchera la scène du Archibald St-Foy. Nul besoin d'être connaisseur en la matière pour apprécier ce style. D'ailleurs, vous serez surpris à quel point vous connaissez ces chansons. Coup de foudre assuré! 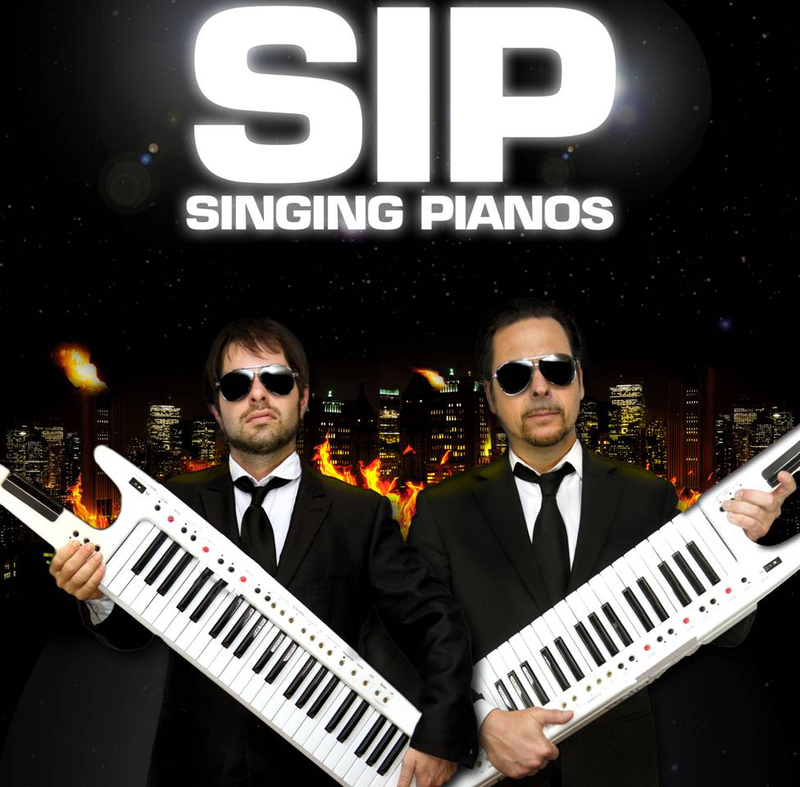 Pour 3 vendredi soirs en février (8-15 et 22), le duo The Singings Pianos sera au Cosmos Lévis. Gordon Graham, celui qu'on a surnommé "le géniteur de Karma Kameleons" va sortir de sa retraite ce soir afin de remplacer son fils (Rock Pichett) souffrant...Donc, pour ceux qui sont nostalgique du temps d'avant, KARMA KAMELEONS ce soir le 31 janvier 2013 au DAGOBERT dès 22h30. Rock on!!!! Skiez au son de Karma Kamaleons pour une bonne cause. Weekend dans le bas du fleuve! Ça va chauffer ce soir et demain (25-26janvier) au Kojak à Rivière du loup! Gill & Gang se charge du party! L’équipe de Scolo Productions aimerait vous souhaiter à vous chers amis/clients/fans, de très joyeuses fêtes. Nous profitons aussi de cet instant pour vous dire MERCI de nous avoir choisis pour animer vos évènements. Faire la fête avec vous est toujours un immense privilège pour nous. L’année 2013 s’annonce déjà bien riche en festivités. Plusieurs surprises et nouveautés sont prévues au cours des prochains mois. Suivez nous régulièrement sur notre site internet et sur facebook pour toutes les nouvelles et les dates des prochains spectacles. D’ici là, passez du bon temps avec ceux que vous aimez. The Singing Pianos à l'ARCHIBALD de STE-FOY le 19 décembre! Ne manquez pas ce sympathique duo de pianistes-chanteurs! à l'ARCHIBALD Duplessis dès 20h30! Décembre, c'est le mois des PARTYS!! Les Karma Kameleons sont aussi en mode PARTY ce mois-ci. Venez faire la fête avec l'ultime hommage aux années 80. Cette invitation est pour vous. On vous attend! Parfait pour couper l'hiver en 2! Le plaisir du Casino de Charlevoix, l'environnement enchanteur du Manoir Richelieu, ajoutez la garantie d'un party signé GILL&GANG les 8 et 9 mars prochain, voilà le tonic parfait pour entamer le dernier droit de l'hiver. Soyez des nôtres! Décembre est un mois fort chargé en nombre de soirées corporatives pour la formation THE SINGING PIANOS. Par chance, elle offrira une performance pour tous le 19 décembre à l’Archibald Ste-Foy. Deux chanteurs, deux pianos des fous rires et de la performance! On ne change pas une formule gagnante! En janvier prochain, la formation BETTER FOR DINNER (B4D) aura le privilège (pour une troisième année consécutive) de divertir les invitées lors de la soirée de la Fondation David Suzuki. Un avant-goût de l'été prochain! Frank Nello sera au Québec de mars à septembre 2013. Pour un avant-goût, visitez la section VIDÉOS de notre site. Vous verrez, Frank est un voyage à lui seul! Malgré les premiers flocons, on pense déjà au printemps! Déjà plusieurs chanceux auront le privilège de faire le party avec les Karma Kameleons. C’est le cas d’un groupe de Plessisville qui aura droit à une toute une soirée le 6 avril prochain. Les KARMA KAMELEONS de retour au DAGOBERT en janvier! Les fans de la formidable revue hommage aux années 80 seront très heureux d'apprendre que dès le jeudi 17 janvier 2013, les KARMA KAMELEONS reprendront du service sur la prestigieuse scène du DAGOBERT. Un MUST SEE les jeudis soirs jusqu'au 28 Mars 2013. Ouverture des portes à 21h. Le Moondance Orchestra animera pour une deuxième fois le Bal du Maire! C'est peut-être dû à l'excellente réaction du public l'an dernier que la formation complète de 9 musiciens a été ré-invitée afin de faire vibrer à nouveau la salle de bal du Château Frontenac lors de la deuxième édition du Bal du Maire de la ville de Québec . Notons que l'an dernier, le bal avait permis d'amasser plus de 200 000$ au profit de la fondation Québec-Jeunes qui lutte contre le décrochage scolaire. On ne change pas une formule gagnante!! The Singing Pianos dans les ARCHIBALD et au COSMOS! À surveiller régulièrement dans nos pages : Le duo The Singing Pianos sera en rotation dans les ARCHIBALD de Ste-Foy et celui du Lac Beauport les mercredis et jeudis et sont aussi très souvent en vedette cet automne les vendredis au resto-bar le COSMOS à Lévis! Cabaret St-Tropez pour la ville de Québec le 4 octobre! Les matelots et le capitaine sont prêts à prendre les armes et à défendre les chansons françaises lors d'une soirée au Centre communautaire Allard (ste-Foy) le 4 octobre. Gill & Gang 4 au Casino de Charlevoix le 26 et 27 octobre! Pour la première fois, la formation de 4 musiciens sera en vedette au bar du Casino de Charlevoix à la fin du mois d'octobre. Il est aussi possible de voir "la Gang" au bar chez Kojak à Rivière-du-Loup les 5 et 6 octobre. GGGC au Festival Forestier de St-Raymond de Portneuf le 22 juillet 2012! C'est confirmé! L'ensemble de 9 musiciens sera sur la Terrasse Dufferin - en face du Château Frontenac - afin de faire vibrer les 500 convives attendues à ce banquet en plein air le 3 juillet de 17h à 19h30. Au menu : la Romance Jazzée bien connue de Gill Poitras et la présence sur scène de la superbe Olyvia Labbé comme chanteuse invitée. Des spectacles de qualité encore cette année. Gill and Gang Goes Country se chargeront de chauffer la place le vendredi 22 juin à 20h00 alors que Steve Hill & Mountain Daisies en mettront plein la vue et les oreilles le samedi 23 juin à 20h00. Pour le spectacle du samedi soir, vous avez la possibilité d’acheter la formule Souper-Spectacle au coût de 30$ avec au menu un méchoui. Une nouvelle formation : The Radio Stars! Nouveau dans notre écurie, La dynamique formation de danse RADIO STARS avec à sa tête Thierry Gomez et Maude Carrier sauront vous divertir à coup sûr! Informez-vous! La ruée vers l'or continue pour GGGC! Suite au "rodage" du spectacle et à l'ambiance que génère la dynamique formation, Scolo Productions et la direction des restaurants Archibald prolongent la série de spectacle à raison de deux jeudis par mois au Lac Beauport et un jeudi par mois au resto-bar de Ste-Foy. Un DVD et un nouveau Vidéo promotionnel pour les KARMA KAMELEONS ! Le DVD - KARMA KAMELEONS - 10 ans déjà! en vente maintenant! Faisant suite à l'événement "10 ans Déjà ! " qui s'est tenu en novembre dernier. Un DVD commémoratif ainsi qu'un vidéo promotionnel vient de voir le jour!! 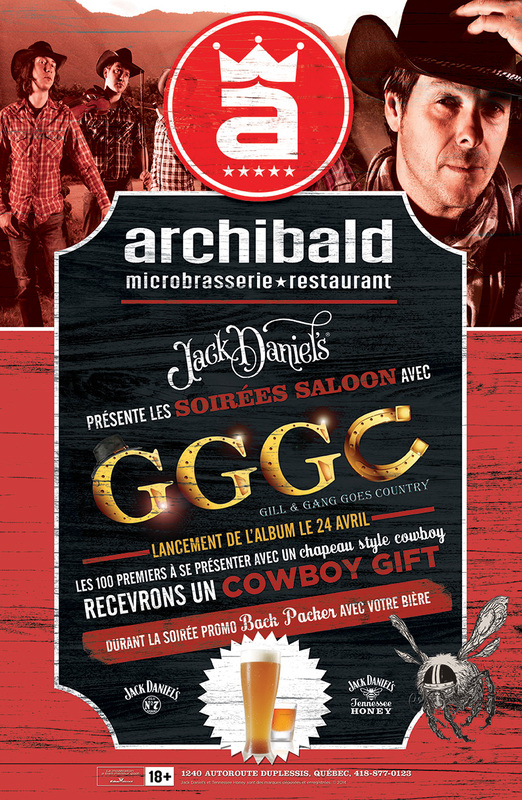 Gill&Gang Goes Country prend son envol à l'ARCHIBALD Lac Beauport le 2 Février! Amateurs(es) de Country-Rock à la NASHVILLE! 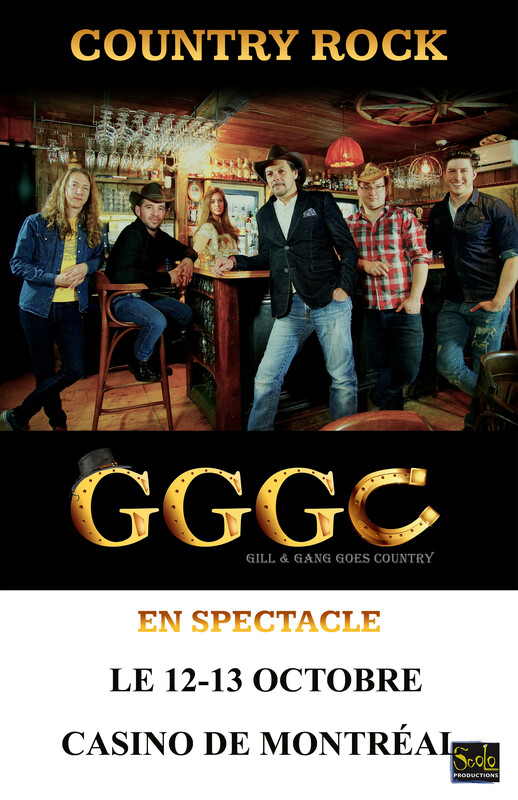 vous êtes conviez à la première du nouveau spectacle de Scolo productions Gill&Gang Goes Country! La formation de 6 musiciens sera en rodage à l'Archibald du Lac Beauport à raison d'une fois par semaine soit le 2 février, 8 février, 15 février, 23 février et le 1er mars ! Chapeaux et bottes de cowboys facultatifs mais fortement suggérés!! Le 20 mars prochain aura lieu le spectacle du 25e anniversaire d’ANEB Québec. Plusieurs invités de marque seront au rendez-vous, dont la grande chanteuse Nadja ainsi que notre ténor préféré Marc Hervieux, sans oublier le charmant Étienne Drapeau, la très dynamique Brigitte Boisjoli, la resplendissante Julie Massicotte ainsi que le séduisant Gill Poitras, sous la direction musicale de Pascal Mailloux. Tous ces merveilleux artistes ont décidé de contribuer au rayonnement de ce spectacle bénéfice qui est d’une importance capitale pour l’organisme. Gill And The Moondance Orchestra at le Bal du Maire de Québec! C'est avec Fierté que nous avons accepté de participer à la prestigieuse soirée Bénéfice à la fondation Québec Jeunes au château Frontenac le 1er Décembre 2011. Plusieurs invités d'honneur dont le maire de Québec, M Régis Labeaume sont au programme de cette soirée animé par Jean-Michel Anctil. MERCI à TOUS LES FANS des KARMA KAMELEONS! Grâce à vous cher public, les membres de la formation flottent sur un nuage! plus de 900 pers à l'Impérial de Québec ont participé à l'événement 10 ans déjà! Surveillez le DVD! Sortie prévue en Février 2012! The Singing Pianos au SAVINI, à L'ARCHIBALD et au COSMOS de LÉVIS cet automne ! LA FORMATION de Québec se produira entre autre après le spectacle de sir ELTON JOHN sur les plaines d'ABRAHAM le 9 juillet! Le 29 janvier 2011, Le château Frontenac était l'hôte d'un évènement magistral en l'honneur de l'environnementaliste David Suzuki. Le Moondance Jazzy Lounge Quartet était présent afin d'y créer une ambiance Urbaine et plannante! Le Moondance Orchestra défoncera l'année au Mont-Tourbillon! Les KARMA KAMELEONS au Château Frontenac le 31 Décembre! LES KARMA KAMELEONS Also in 'les Petites Grenouilles' this fall ! 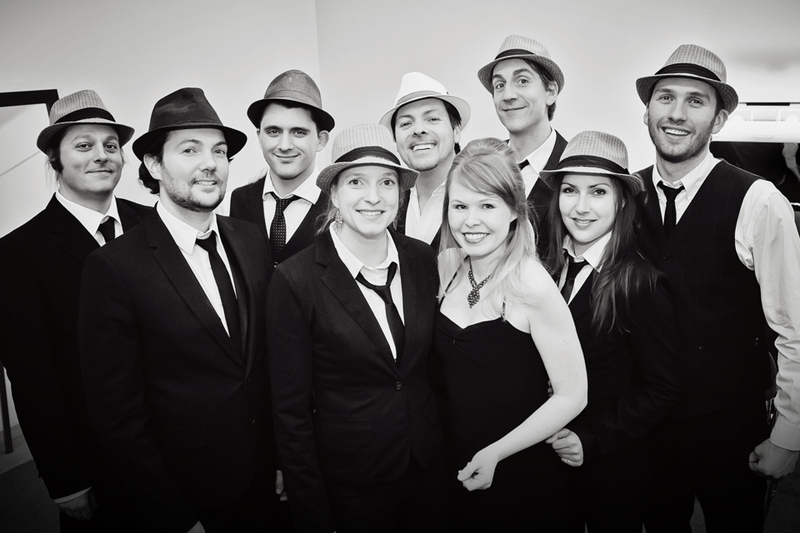 A show from Scolo Production for your business party ? Good idea!! A lot's of fun with the Karma Kameleons at Stoneham! KARMA KAMELEONS Live every thurdays at the Dagobert! Tu veux devenir un fan de Gill et tu veux tout connaître de ses prochains spectacles. Rend-toi sur le lien suivant et devient fan de Gill and The Moondance Orchestra.